2. Right click on the date and time. A window will open. Click on “Adjust date and time”. 3. 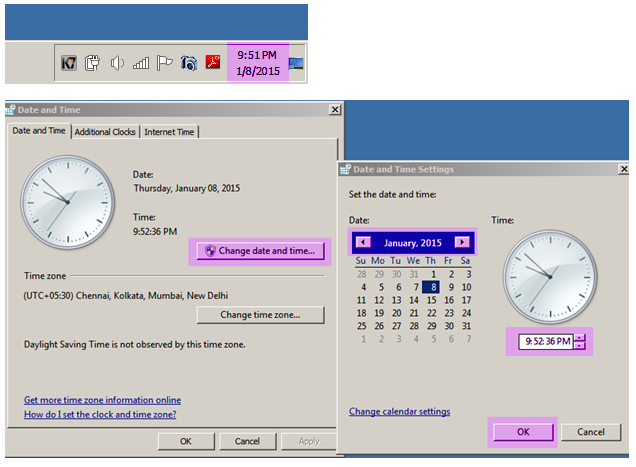 In the window opened, you can change date and time. 4. In the calendar, you can change the year by using the click button at the top. On clicking the button, year will progress and you can arrive at 2015. 5. Then adjust time. This can be done by selecting or using back space to remove the time and retyping the current time. 7. Then close the browser, if already opened and reopen. Then search. You can open the websites. Previous How does the Computer keeps Calendar?